AGEP alliances consist of institutions dedicated to supporting underrepresented minority students, women, and students with disabilities to complete advanced degrees in the STEM fields. Alliances provide a variety of support programs including research support, professional development and mentoring, as well as cultural and social activities. The National Science Foundation's AGEP program is committed to the national goal of increasing the numbers of underrepresented minorities (URMs), including those with disabilities, entering and completing STEM graduate education and postdoctoral training to levels representative of the available pool. Increased URM participation in advanced STEM education and training is critical for supporting the development of a diverse professional STEM workforce especially a diverse STEM faculty who serve as the intellectual, professional, personal, and organizational role models that shape the expectations of future scientists and engineers. 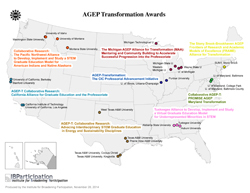 To achieve this long term goal, the AGEP program supports the development, implementation, study, and dissemination of innovative models and standards of graduate education and postdoctoral training that are designed to improve URM participation, preparation, and success. The alliance includes five, PhD-granting institutions in the STEM fields of science, technology, engineering, and mathematics (Texas A&M University, Prairie View A&M University, Texas A&M University-C . . . read more. The University of California-Berkeley will lead a regional network with the University of California-Los Angeles, Stanford University and the California Institute of Technology to refine, implement, s . . . read more. The California Alliance for Graduate Education and the Professoriate (California Alliance) consists of the University of California, Berkeley; University of California, Los Angeles; Stanford Universit . . . read more. The underrepresentation of African Americans, Hispanic Americans, Pacific Islanders, and Native Americans in science, technology, engineering, and mathematics (STEM) graduate programs is well known an . . . read more. The proposed project will enhance the leadership development experience for women of color who provide the kind of academic and psychosocial support for underrepresented minority students that leads t . . . read more. The project includes activities to address faculty and postdoc behavior and knowledge about mentoring, advising, and mitigating implicit bias and micro-aggressions as well as activities to support dis . . . read more. NSF’s investment in the Tuskegee Alliance to forge Pathways to STEM Aca . . . read more. PROMISE: Maryland’s AGEP is an alliance of the three public research universities in Maryland, led by UMBC, dedicated to the increasing the number and diversity of Ph.D. graduates in the sciences and . . . read more. The mission of our Scholarship service is to give more American Indians and Alaskan Natives the resources and encouragement they need to learn and succeed. By harnessing the power of knowledge, these . . . read more. Required Qualifications: US Citizen & PhD in a Science, Technology, Engineering or Math (STEM) field. Preferred Qualifications: Expressed interest in tenure track faculty positions at research intens . . . read more. Underrepresented minority graduate students in Science, Technology, Engineering and Mathematics (STEM) face multiple challenges with identity negotiation as they progress through graduate programs at . . . read more.